We first came to Dalyan to celebrate our Silver Wedding Anniversary in 1998 and returned September the same year. After which we have not been able to stay away. Enchanted by the sheer beauty of the scenery sea, river, mountains, lakes and beautiful trees and reed beds. The hussle bussle of the small town life, farming, fishing and cottage industries all co existing with the charming hospitality of the tourist trade. The boats and buses are many and frequent and organised through a cooperative so every driver and captain get their share. Friendly people who do not hassle you in the street to “come buy” but who welcome you in for a complementary apple or Turkish tea so they can sit and chat and practice their English. 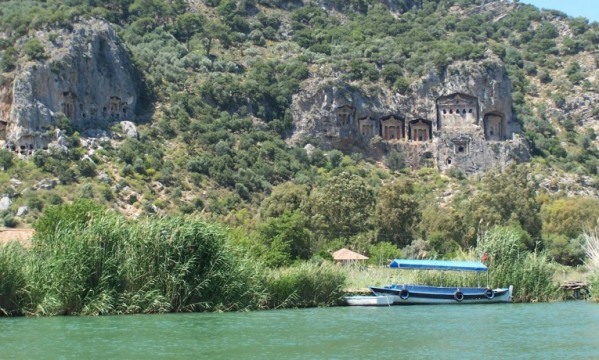 The majestic Lycian Rock Tombs of Kaunos take pride of position and seem to oversee the whole of Dalyan life now as they have for the last two millennium. There are lots of things to do in Dalyan, including boat trips, sailing, mud baths, turtle spotting, Turkish baths, white water rafting, snorkelling, diving, a beautiful deserted beach and visiting the ancient ruins of Kaunos. Or you can of course just relax and enjoy the sun, sea and sand. 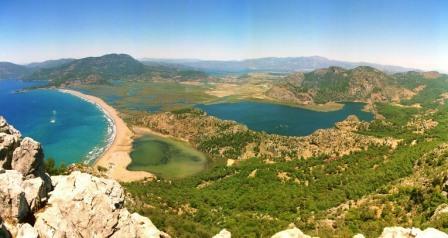 Since 1986, Dalyan and its delta has been a conservation area and wildlife sanctuary. Because of this, the small town on the South West coast of the Mediterranean has kept it's Turkish charm and appeal. Proudly guarded by the Dalyan authorities. Many people like us return year after year, a few never leave. Zeytin Koru itself was built on the site of an olive grove. 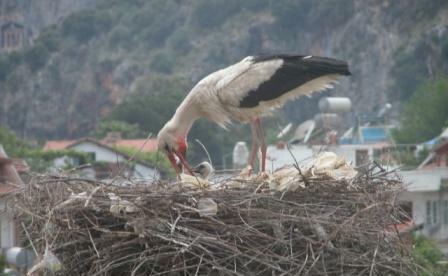 Many birds visit its garden and many birdwatchers come to Dalyan as there are over 200 different species to see. Approximately 3 miles from the centre of Dalyan lays the 3 miles long sandbar Iztuzu beach that juts out from the main land into the Mediterranean. This site was earmarked for development until it was brought to the authorities’ attention that it was one of the last nesting grounds for the endangered Loggerhead Turtle. A campaign with David Bellamy and a local woman Kaptan June (Haimhoff) was successful in stopping the development of Iztuzu Beach. Visiting times to the beach are restricted to daytimes only from May - September when the Turtles are nesting. You can reach Iztuzu by Boat (approx. 40 mins) or Dolmus (approx. 20 mins). The boat winds its way down the channel, through the rustling reeds, where the “ African Queen” was filmed, to the open tip of the beach, with an opportunity to spot the turtles, and many species of birds. The Dolmus (local bus) travels lakeside and over the mountains through beautiful winding roads lined with Oleander. Both ways offer spectacular scenery and are well worth doing. For an historic cultural experience take the rowing boat ferry across the river (200 yards from the villa) and walk up the back lanes to the ancient ruined city of Kaunos. This was a very significant city port, with ruined temples, an amphitheatre, castle and walls but unlike Greece or Rome you can take your viewing at leisure in the cooler parts of the day with few other tourists to compete with. ( visit our link to the history of Kaunos). Held every Saturday is not to be missed. As well as having fun haggling for ‘Genuine Fakes’, ‘Cheaper than Asda price’. There are many varied stalls great for those holiday gifts and a must to stock up on your fruit and veg for the week. It has to be said that we love Turkish food, one of the reasons we love Dalyan so much. As there are over 60 restaurants to choose from it is hard to narrow down just a few to recommend. We do of course have our favourites and many good friends amongst the staff. Whilst those listed in our information pack offer very friendly service and good food and are located in the centre of town, half the fun is in exploring all the back streets and roads leading out from the centre where you will find many small local food bars. On the more rural lanes you will find garden restaurants. There are special river and wildlife sanctuary restaurants out of town which offer a free pick up and drop off service. From the rivers edge, right to the end of the boat moorings past the mosque almost to the furthest point, some restaurants allow a view of the huge river turtles . A full four course Turkish meal watching these fascinating creatures is expressed by everyone who sees it “an experience of a lifetime”. We have bought 3 Carpets in Dalyan and taken them home as hand luggage to our Cottage in England and of course there are those that we have we have bought for and placed in the villa. There are several carpet shops and good experts to advise you. We think that carpets like jewellery are very much a matter of personal taste and so we could not make recommendations. We have only purchased from two shops ourselves , what we can say about both is that before you agree a price haggle, haggle and haggle again for their ‘best price’ and a very enjoyable experience.